So, you are thinking of adding a rabbit to your home. Fantastic! They can be wonderful companions! Before you head out to the rescue or adoption center, take time to think about your lifestyle and what you are looking for in a new friend. Is a companion rabbit right for your family? Do you enjoy learning about animals? Rabbits are fun, but they are quite different from dogs and cats. Does your family spend a lot of time on the floor? Rabbits often prefer to interact with people on their level. Is anyone in your home allergic to hay? Hay is the major part of a bunny’s diet. Asking questions like these before you start your search can help you decide if a rabbit is right for you. It’s easy to fall in love with a cute face or adorable photo. We are all drawn to rabbits of certain sizes, breeds, or appearances. However, you should consider what you are hoping for in a rabbit’s personality, and what kind of interactions you expect to have with your new rabbit. Is your house an active one, a quiet one, or somewhere in between? Some rabbits thrive in a house with lots of activity. Those rabbits may be curious and outgoing, and are the first to investigate something new! 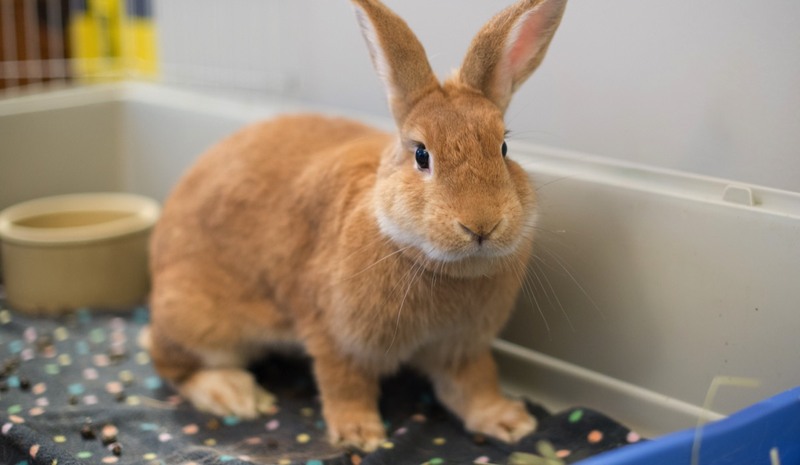 Other rabbits may find lots of activity scary, and would thrive in a quieter home. Think about the activity level of your house and talk about it with your family. Consider how all members of the household, including other pets, might react to the new rabbit. Be sure to discuss any concerns with the adoption team for your chosen rescue organization, as they may have helpful resources to assist with the transition or introductions. Do you work long hours? Or, do you have an active family with school, and after-school activities? If you may have limited time for your new rabbit friend, consider adopting a bonded pair! They will have one another for company while you are away, and your whole family may still have a great, interactive relationship with them. Is it important to you that a rabbit likes attention, has an aptitude for clicker training or logic toys, or loves to explore? Should they be comfortable with children or other pets? Will they frequently interact with non-family members, such as a pet sitter? Every rabbit is different, and it’s important to take your time in finding one that is illustrating the interests or qualities that fit with your family life. A rabbit that is frightened of dogs, for example, would not do well in a home even with a gentle dog. A different rabbit, however, may enjoy having a gentle dog friend. Do you want a rabbit you can carry around, or hold frequently? Who wouldn’t, right? How important is that to you? Often rabbits don’t like to be picked up or held. As prey animals, being picked up goes against a rabbit’s natural instincts. If you think about their wild relatives, there’d only be one reason why they would be picked up, and it would not end well for them. There are, of course, exceptions, and some rabbits do enjoy being held. Giving the rabbit a choice in how they interact with you is great for building a loving relationship based on trust. Rabbits are very curious, and frequently enjoy interacting with people on the floor. Some bunnies enjoy lounging on the couch, and may even want to join you while you watch your favorite movie! Where do you go to find your new friend? Rescues and shelters are great places to meet potential new family members. Rabbits in rescues and shelters have often been cared for by foster families, volunteers, and staff that know about their personalities. The staff and volunteers can tell you about the rabbits in their care, and are a helpful resource. Talk with the adoption team for your rescue or shelter about your family, and meet several rabbits. If possible, when you go to visit bunnies have the whole family come along to see how they respond to the rabbit, and how the rabbit responds to them. You may find that you hit it off with some animals, and not with others. Taking time to consider what you are looking for in a rabbit’s personality, what your home environment is like for a rabbit, how all family members will react, and what your expectations are for a relationship with your new companion rabbit, will help you find the best possible match for your home. Thank you for considering adoption first!